With great sadness, we announce the passing of Nii’ta’Kaiksamaikoan (Pete) on November 27, 2018. Pete is mourned by his family and community for the loss of one of Siksikaitsitapi’s (Blackfoot) legends. He was a visionary and complex man, who possessed a quality of mystery, and surpassed all expectations. He was foremost a Kaaahsinnoon (grandfather) for the Horn Society, his devotion and connection to the land was expressed through his ceremonies and through his ranching and horse breeding. He can also be described as; an educator, stock contractor, leader, rough neck, activist, pioneer, artist, story teller, bronc rider, cowboy and advisor to community, organizations and governments. He was known among family and friends, as extremely independent, meticulous, humble, and graciously supportive. These traits were the core of his friendships and work ethic. Pete devoted his life to being a role model for his children, grandchildren and the Blood Tribe community. His children can be celebrated for taking on this trait of their father. He took pride in their independence and tenacity. He was well known for one of the teachings of the Blackfoot way of life, which is to “be of service” and provide support. As his children and grandchildren could always count on him, he often supported their activities and interests without being asked. 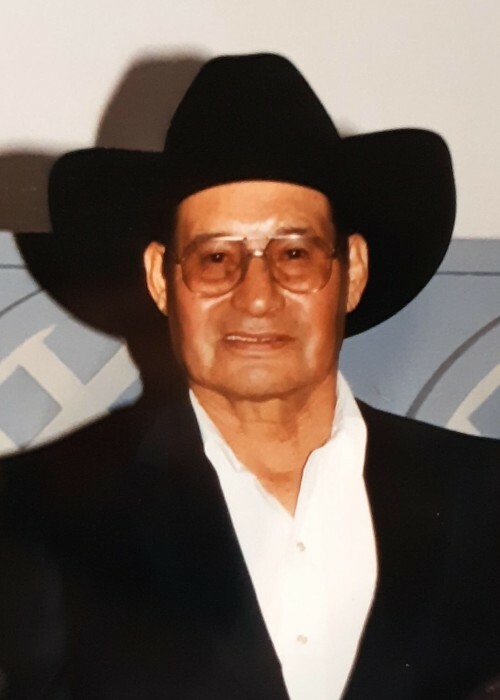 Pete had a profound interest in the youth, whom he had great faith for a better future, especially those who were interested in rodeo and cultural teachings. Pete gave himself to his family, he gave them the necessary support to satisfy their pursuits; moreover, to the larger community he gave to anyone who asked for support such as, ceremony, transferring teachings, headdresses, and advice. He possessed this exemplary trait of being a Blackfoot Indian. He often stated how proud he was of being an Indian, something he did not have until he joined the Horn Society. Pete was born on the Blood Reserve, where he attended the St Paul’s Residential School. At a very young age, he pioneered for work in the United States. He worked among the Oil Servicing Industry and Ranching. Pete with his humility and meticulousness work ethic was guaranteed work on the Reed Family Ranch, currently a multi-million dollar operation. His grandson Odessa is the namesake of his experiences in Texas. After ten years in the United States, he returned and applied his experiences and started his own cow ranch and horse breeding operation. Pete was proud of his accomplishment as one of the last free-range ranchers and was vigilant in his horse breeding. His success in breeding bucking horse earned his horses awards as champions in the arena, such as Indian National Rodeo Finals (INFR), Nebraska and Wyoming. Pete was devoted to the Blackfoot way of life after he began participating in ceremony. He actively participated in repatriation of the Horn Society bundles from the Alberta Provincial Museum, the revitalization and resurgence of ceremonial gatherings, supporting the Blackfoot Confederacy ceremonials through transfers and the initiations of the Horn Society to the Blackfeet in the United States. He more recently was transferred a Thunder Pipe Bundle. Pete was extremely pleased when his sons Travis and Pat joined the Horn Society, and when his grand daughter, Miracle became the Okan. Delores, his predeceased daughter and her partner Peter Weasel Moccasin, his sister Sophie, Francis First Charger, Leonard Bastien, Martin Heavy Head and Roger Prairie Chicken were few of the elders who had an unwavering commitment in supporting his initiatives. As he understood the spirituality of the Blackfoot was the source of our strength and health and its' continuity dependent upon the survival of the language and culture. He will be missed by those who he provided support and as a resource for culture, history, language and ceremonial activities. Two notable contributions are, first, the Blood Tribe Agricultural Project, which is the second largest irrigation project in the world. Pete referred to it as the flagship of the Blood Tribe; it produced and processed the highest calibre of hay to meet Japan’s standards. Secondly, recently he gave a name to Niitsitapi Learning Centre (Niitsitapi li tass ksii nii mat tsoo kop) a school in Calgary, an experiential learning environment which has had great student success. He was a cultural adviser to the Red Crow Community College and the University of Lethbridge, Galt Museum and Archives, Calgary’s Glenbow Museum to name a few. Other contributions include; the giving of Blackfoot names such as to the Mayor of Calgary and ceremonial rooms, transferring headdresses to significant government officials and dignitaries which included Prince Charles, former Prime Minister Stephen Harper and former premier Ed Stelmach and many of the Kainai Chieftains. Pete’s passion was rodeo, as consequence, he raised a large herd of cattle which he used for his rodeos and the herd of horses from which he trained his bucking horses; and derived a lot of pleasure in seeing his bucking horses in action. Pete was able to host rodeos and supplied the stock for it. It was his way of supporting the rodeo industry and the local cowboys especially the bronc riders, as in his youth bronc riding was his passion. He was very proud of his son Pat, a bronc rider, whom he personally drove to many rodeos. During the filming of Circle of the Sun, he was in Montreal Quebec, where with the support of the National Film Board staff, he registered to ride at the Calgary Stampede. To his surprise, he was announced at the Stampede as Pete Alone from Montreal Quebec. 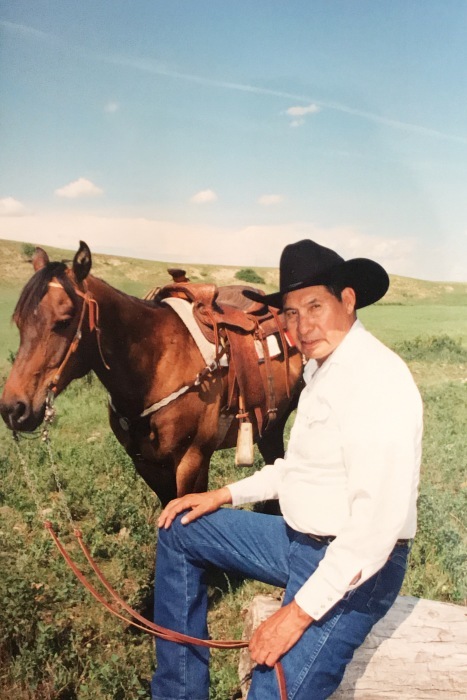 Pete was known for his knowledge of horses and the stamina for riding, often times he could ride more than forty miles a day, and had the experience of a time when the Blood reserve was mostly prairie with few fences. At the age of 68, he joined the Great Centennial Cattle Drive, where he and his loyal horse Bucky spent six days and crossed the open prairie making history for western Canada. In the later years, from the fruits of his labor, with his son, Fagan, made many arduous trips to the Indian National Rodeo Finals (and other rodeos), full horse trailer carrying up six horses. These trips were his holidays; he enjoyed the long drive with his son, where they spent time reminiscing and planning for the next season. Pete was brought to the world stage with his 15 films, NFB trilogy: Circle of the Sun, Standing Alone and Round-up; these films created an awareness of the Kainai World while connecting the past to the present and simultaneously creating a future for generations. A Pinto for a Prince brought fame for his originality in saddle making. On his Birthday, the Late Colin Low wrote; “I am always surprised at his concerns for authenticity, truth and community. He explores the world in a way that most people cannot imagine. I don't think that Pete realized how much he influenced me”. Pete’s family life was situated in the Old Agency area, where he was instrumental in building the Old Agency Hall while on council. He had made a pledge to have a community-gathering place, where activities would strengthen family and community interests. While in North Dakota, he married the late Serena Bad Brave and they had a daughter. Upon his return from the United States, he and the late Shirley Mountain Horse also had one daughter. He later shared his life with the late Mattie Plaited Hair, and their union was blessed with four children. Pete’s family continued to grow amidst the Belly Buttes overlooking his place, where he made his home with Hilda Smith (nee Day Chief) and they welcomed three boys. Later in life, he met Betty Bastien whom he shared his life with until his passing. Pete is also survived by his siblings; May Weasel Fat, Ruth Quesnelle (Carmen McLenaghan) Sophie Tailfeathers, Alfred Standing Alone, Nita Wells. Extended Families; Many Fingers, Day Rider, Shot on Both Sides, Cross Child, Buckskin, Chief Calf, Twigg, Russell, English, Crop Eared Wolf, and many others too numerous to mention, constituting a large extended family. Brothers-in-law: Dan Weasel Fat, Fred Tailfeathers, Wayne Wells; Ruth’s late husband Horace Quesnelle; Sister-in-law: Lily Standing Alone. The family would like to extend their deep gratitude to Dr. Eagle Bear and the staff at the Kainai Continuing Care center for their compassionate and stellar care. A Wake Service will be held at Kainai High School, Blood Reserve, AB on Friday, December 7th, from 7:00-11:00 p.m.
​The Funeral Service will be held at the Kainai High School on Saturday, December 8th, at 11:00 a.m.
​Interment will follow at One Spot Cemetery (Old Agency), Blood Reserve, AB.